I don’t know about you, but over the holidays, our sleep schedule gets messed up. We are up too late at night, too many nights in a row. We have more company than usual. And as you can see in this video, Mama stays in her bathrobe longer than usual (nevermind, by bathrobe is normal, ha!). Sometimes breakfast turns into brunch. And that’s fine! 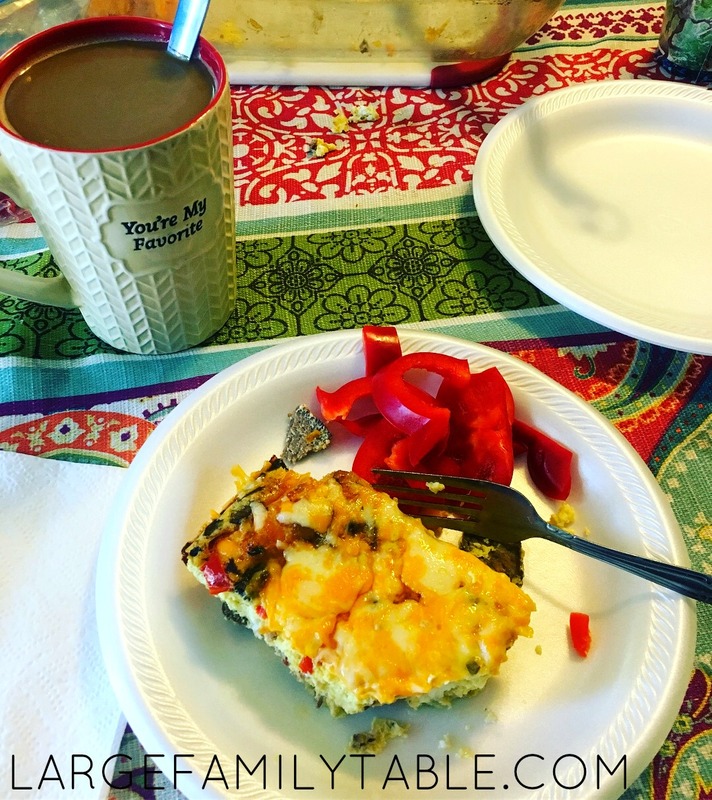 Sleeping in a little and then sitting down as a family to a hearty brunch like this breakfast casserole is a great way to begin the day, even if it is a bit later than usual. I know that breakfast casserole is nothing new. I do think though that a lot of people think it is a complicated thing to make with tons of ingredients. You all know that I am not a woman who cooks with tons of ingredients or complicated directions. Not at all! The simpler the better. After all, if I keep it simple I can let the littlest of the children help me more often. 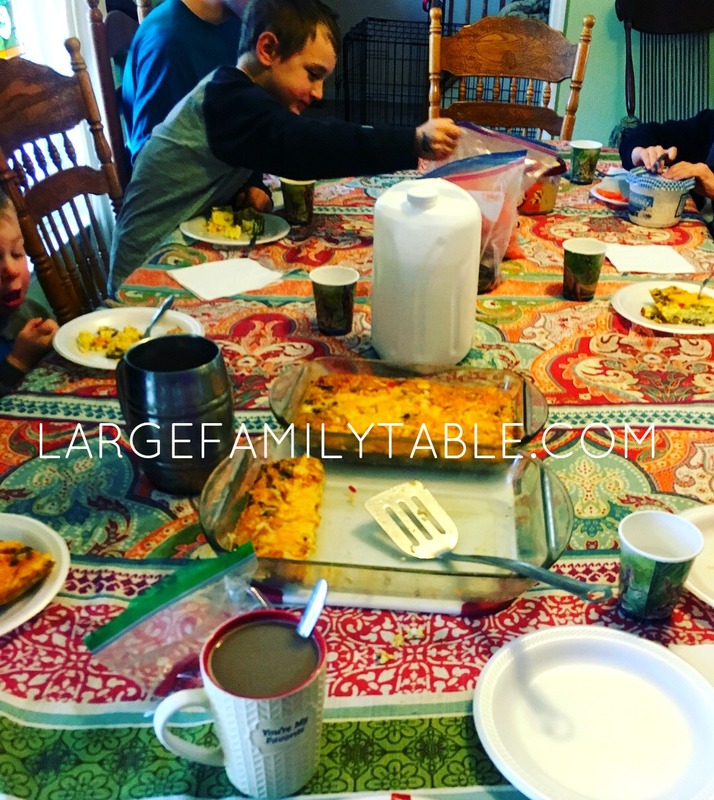 Now, onto how I made this breakfast casserole with Mr. Daniel as my adorable helper and hugger of the eggs. And also the kisser of Mama’s hand. <3 Sweet boy. This casserole is unique in that I used steak instead of sausage. 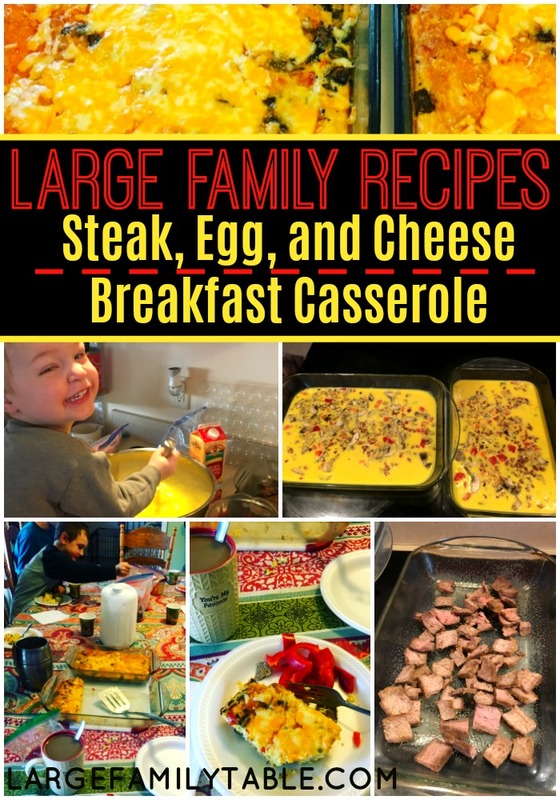 I know that most breakfast casseroles call for sausage or even ham as the meat ingredient. So that’s what I’m doing! My motto is, “Use what you have!” This recipe is also Trim Healthy Mama (Smeal) friendly and obviously low carb to boot! Spread steak or desired meat in bottom of two 13 x 9 pans. Whisk eggs with heavy cream and pour over steak. Sprinkle chopped veggies over eggs. Sprinkle cheese over top of all. Bake at 375* for 35 minutes. Remove from oven and sprinkle 1 extra cup of cheese over each casserole. Stick back in oven on warm until ready to serve. 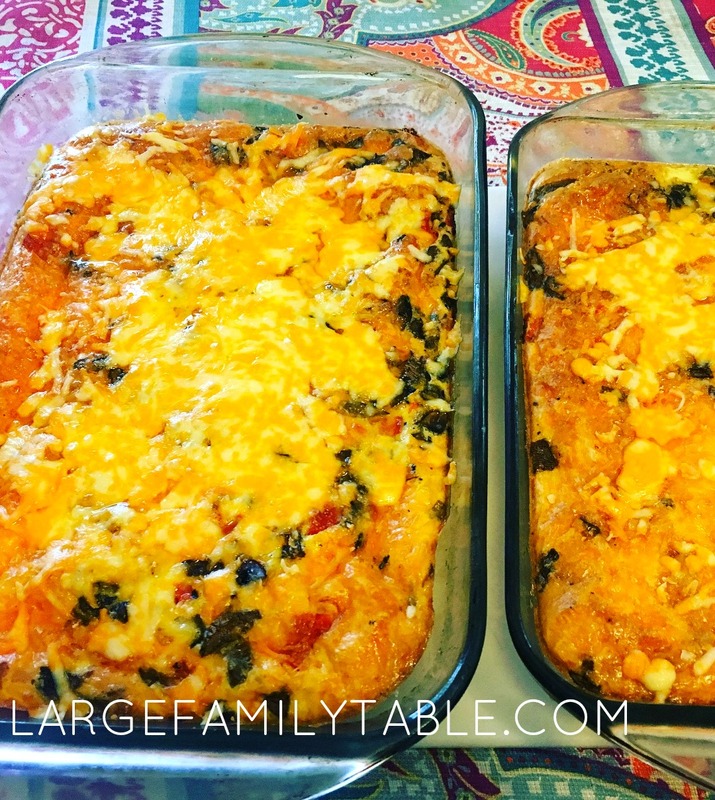 After these casseroles were done, I put them back in the oven on warm with some extra cheese on top while we finished getting things ready to eat. Fresh carrots, sliced peppers, and veggie dip were added by the children to round out our brunch. Once I gave everybody their first serving, the first pan was just about empty. I always plan for leftovers, but sometimes we eat more than I expected on our first go-round. Ah well, that means they enjoyed it! I hope you and your family enjoy it too! Click here to cook with Daniel and I as we make this Steak, Egg, and Cheese Breakfast Casserole! Is this freezer friendly? Also is it okay to freeze eggs in its soupy form? 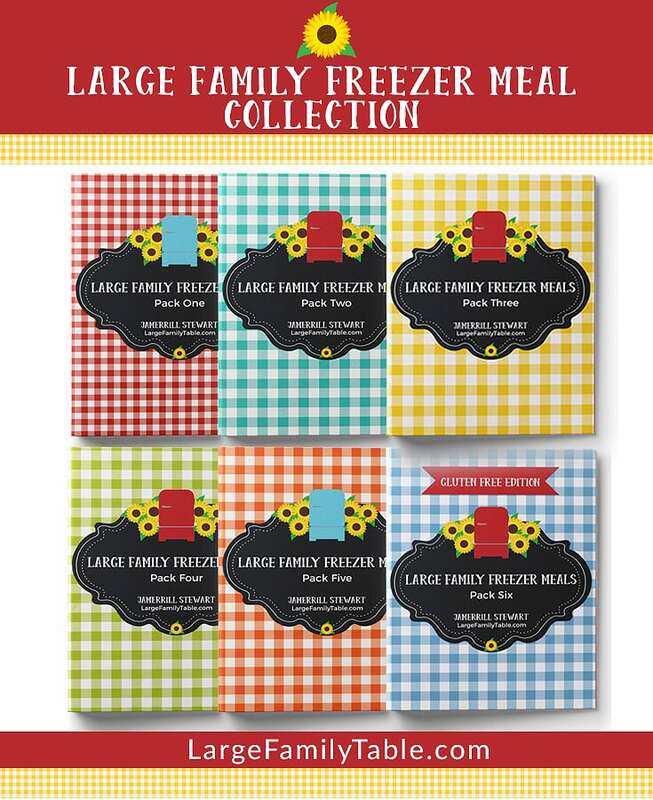 I’m asking this also for your fried rice freezer recipe! I wanted to make sure I didn’t need to cook eggs first!